We all know that the Mustang is an important vehicle for Ford, purely from a branding perspective. The Mustang name is worth more than its weight in gold – everyone knows what it is, a majority of people have owned one or aspire to own one, and it continues to handedly outsell its closest rivals, the Chevrolet Camaro and the Dodge Challenger. 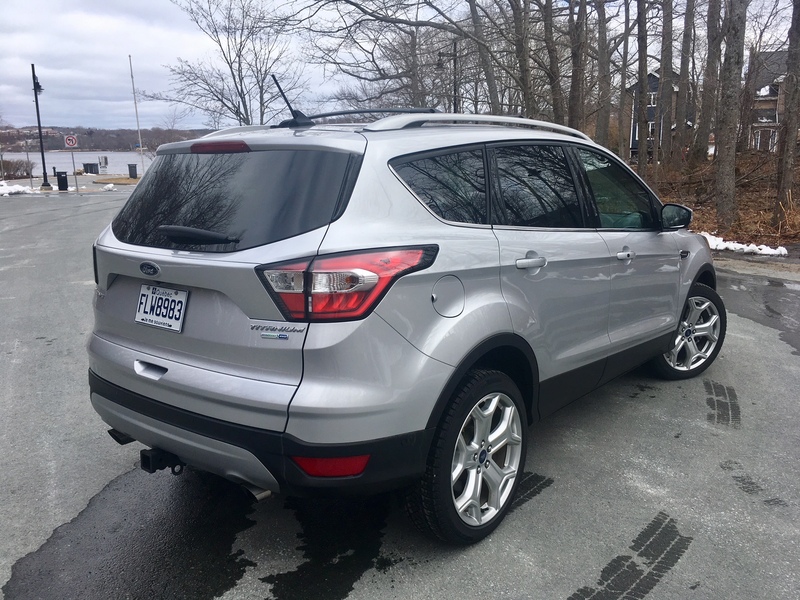 But as important as the Mustang is, there is no model more important to the blue oval than the Escape. The Escape’s success is crucial for the brand. 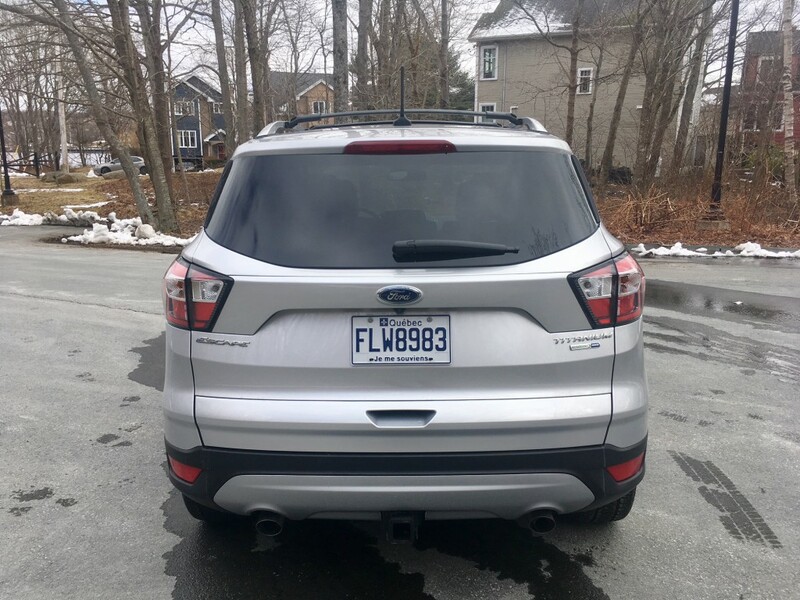 That might be why this is the 4th Escape Ford Canada has sent my way for evaluation since 2013. It’s well worth the time and effort to get the earned media. It also gives me a pretty good sense of what the Escape is all about. And for 2018, Ford is hoping people will still consider it, even though most of its competition has been significantly redesigned. 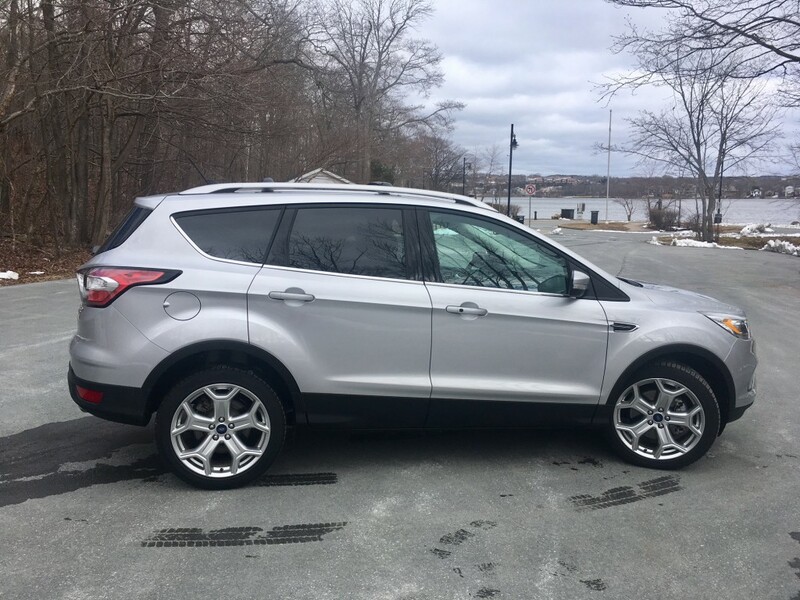 It’s crazy to think that this latest Escape isn’t really the freshest compact SUV out there, considering its latest redesign came only last year. 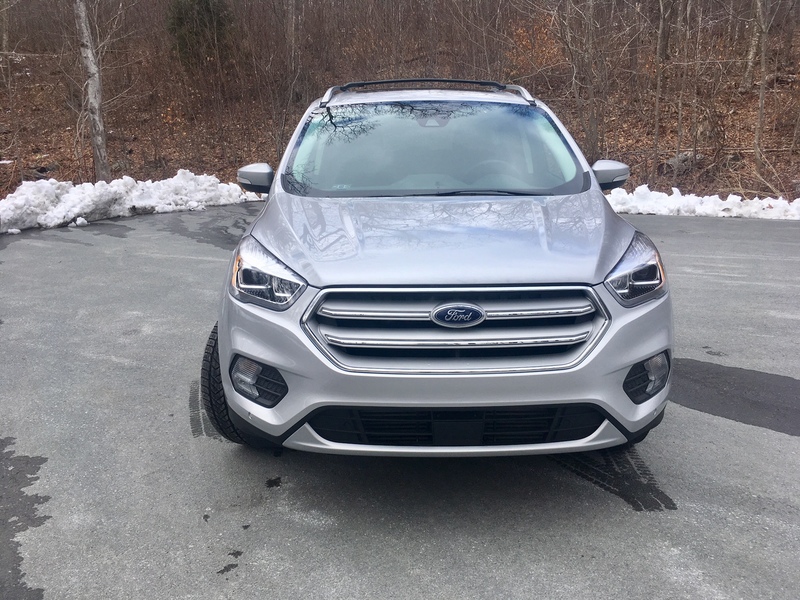 Back then, Ford went back to traditional SUV styling after hearing from customers who preferred it to the previous model’s more curvaceous lines. Still, my tester garnered mixed opinions on its looks which was a bit odd since the Escape in every iteration has never had any offensive exterior styling cues. 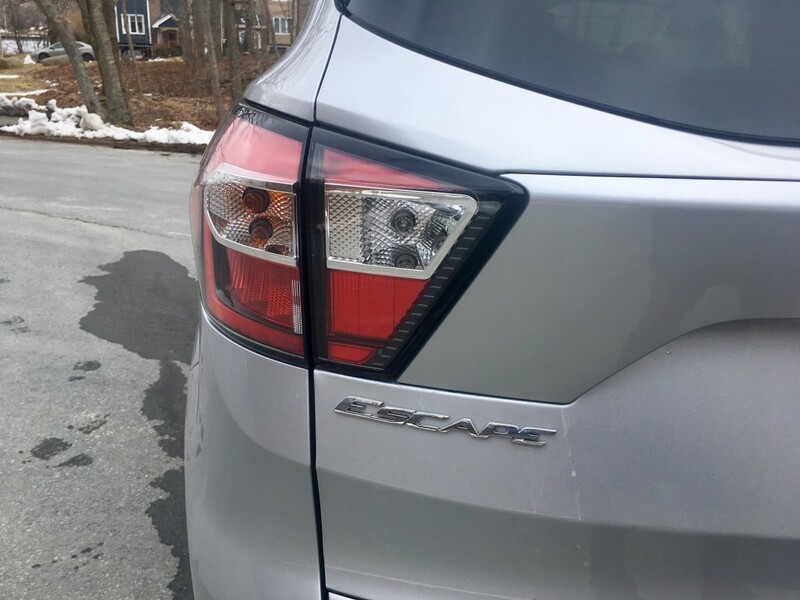 Personally, I think the Escape completes its mission. The new grille and redesigned headlights look good, the front turn signals and fog lights are better integrated and the nice looking optional 19-inch wheels steal an older wheel design from the Focus ST.
There’s another Focus element when you step inside and it’s in the form of the steering wheel, which is taken directly from the compact offering. 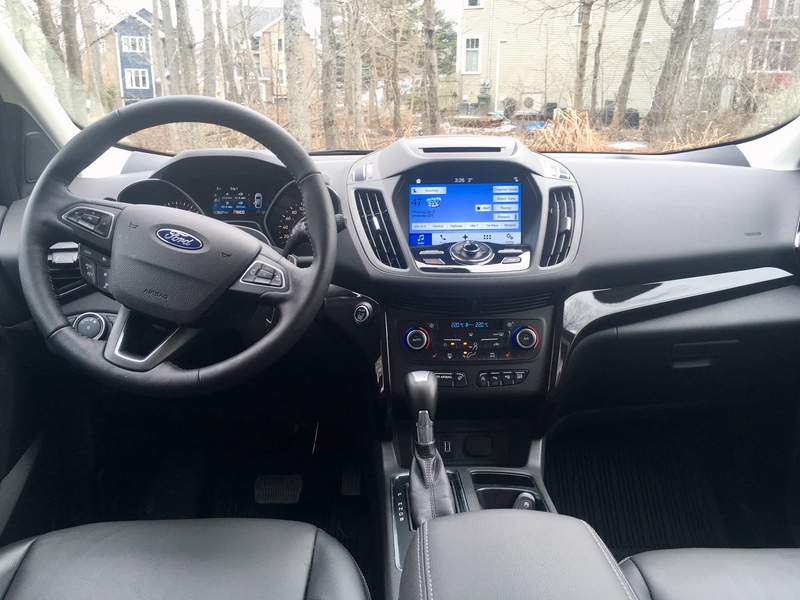 The wheel itself has a nice feel to it and the overall interior design is much improved from the new placement of the shifter and the addition of an electronic parking brake to free up more room, and the new Sync3 system which is miles kilometers ahead of the older system. There’s hard plastics to be found throughout the cabin, but not in any sort of place where a human being would often touch anyway. Getting back to that Sync3 system, it is much better organized and responds better to commands but it still does have a bit of a finicky side. There were times when the information displayed did not correspond with what was actually playing on the radio (admittedly, this may be a glitch with SIRIUS itself), and there were a couple of times when it seemed to take its time to respond to command. Overall though, this system is good and is likely to only get better. 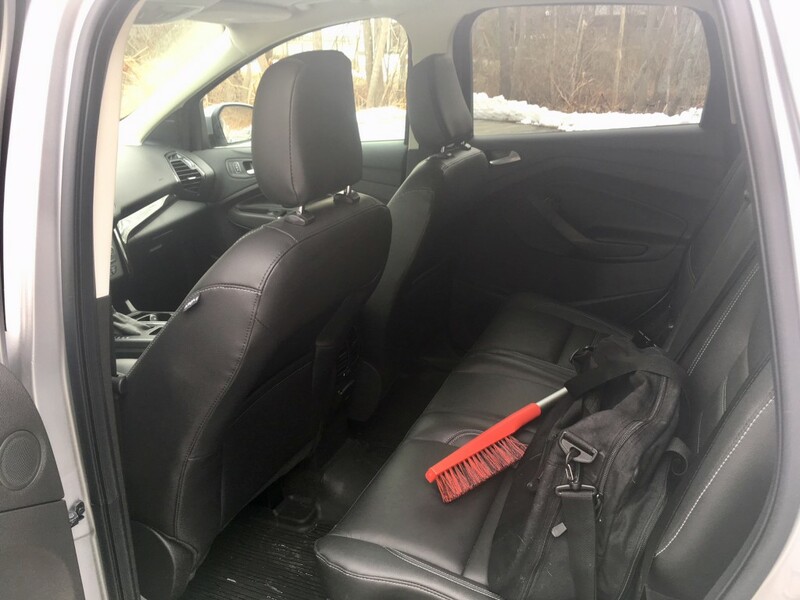 Likewise, most people will find rear seat room to be good as well. 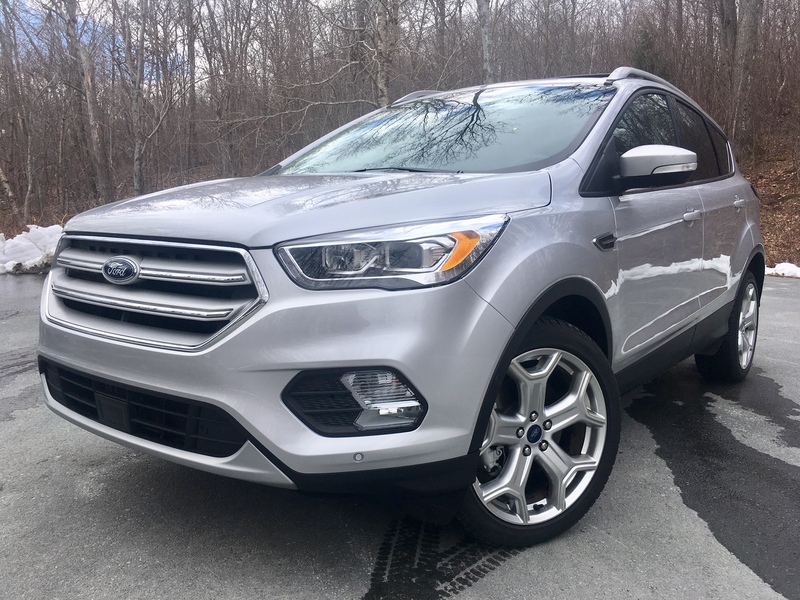 The Escape is one of the smaller offerings in the segment, but it will do the trick for most, assuming they aren’t relegated to the middle seat. Cargo room comes in at 964 L with the seats up and expands to 1926 L with the second row seats folded down. 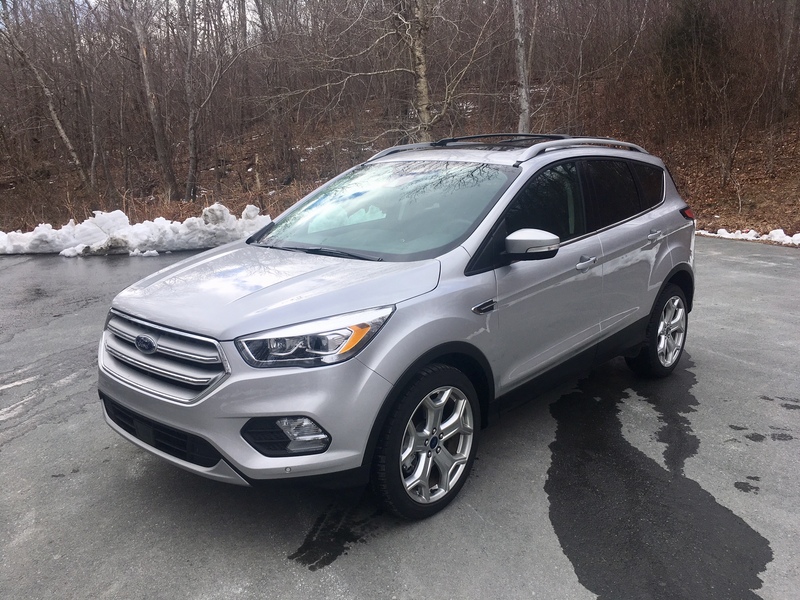 There are three engine options available in the Escape. The first is a 2.5 four cylinder which makes 168 horsepower and 170 pound feet of torque. The next is a 1.5 Ecoboost (which is Ford speak for turbocharged) which makes 179 horses and 177 pound foot torque. The final engine unit available is a 2.0 litre twin scroll which makes 245 horsepower and 275 pound feet of torque. The latter is only available in the top Titanium trim and thus was the engine fitted to my tester. All engines are mated to a six-speed automatic transmission. The engine itself performs well, there’s plenty of punch when you need it with it be low end grunt or passing on the highway. 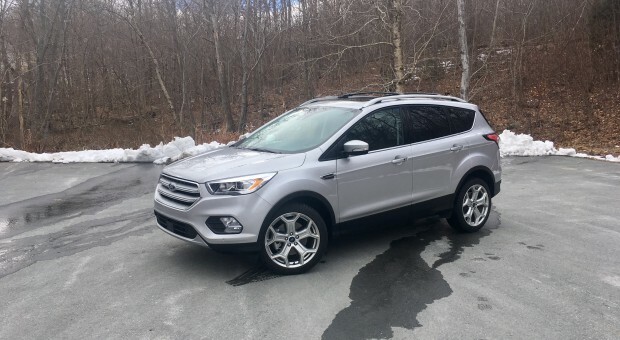 There’s no doubting that the Escape feels quick on its feet but I also can’t help but wonder why so much power is available in the first place. The targeted market for the Escape doesn’t generally consider lots of power as a top priority. And while no one wants a car that is particularly slow, I don’t think too many people are in such a hurry to collect their groceries. My advice would be to stick with the 1.5 litre which offers plenty of acceptable power along with a bump in fuel efficiency to boot. 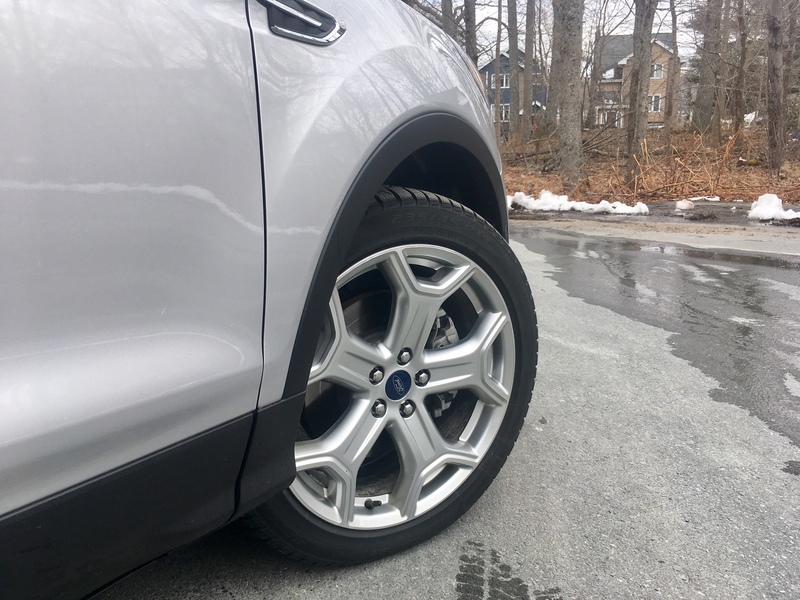 Handling is only bested by the Mazda CX-5 at this point, the Escape feels fairly surefooted for a vehicle with a raised ride height. Is it the most comfortable in the segment? No, that honour now likely falls to the VW Tiguan, but if you don’t opt for the 19 inch wheels, comfort in the Escape is likely to increase. The good news, steering feel is nearly bang on – not too weighted and not too light feeling either. 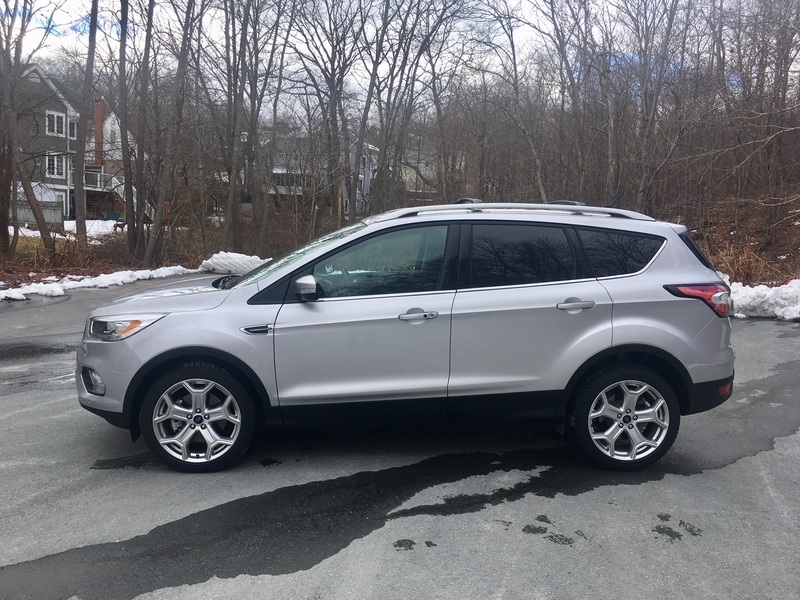 The Escape’s small-ish size is a plus for around town driving though it is let down by a fairly wide turn radius, which makes parking a tad more difficult than it needs to be. But the rearview camera offers good, clear visibility and there are different angles to choose from. Besides, if you go for the Titanium, you won’t have to worry much about parking since it comes with an auto-park feature which essentially takes care of the task for you, be it parallel or reverse perpendicular parking. The Titanium also nets you niceties such as a heated steering wheel, HID headlights, adaptive cruise control, blind spot monitoring and more. Official fuel consumption figures for the 2.0 litre Ecoboost come in at 11.5 L/100 kms city and 8.8 highway. During mostly city driving, I returned 11.9 L/100 kms. While some of the increased fuel consumption could be chalked up to colder winter temperatures, it did take a long time for the fuel consumption figures to go down. It wasn’t until near the end of my week with it until it started to dip beyond the high 12 figure range. As is the case with most modern day Fords, there tends to be more boost than eco when it comes to these engines. If fuel efficiency is important to you, the 1.5 litre is the most efficient offering coming in at 10.2 city and 7.7 highway. Despite the disappointing fuel consumption numbers the Escape remains a competent vehicle in the segment and is still among my top three recommendations. 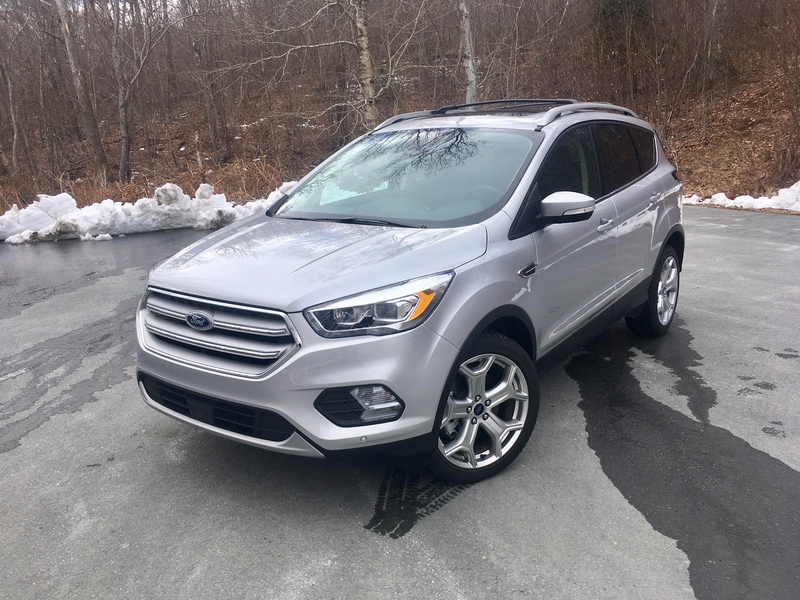 But in order to get the finest version of the Escape, I’d say it’s best to limit yourself to the mid-trim with the 1.5 engine which still offers decent power, more efficiency, plenty of decent features and, of course, less initial cost. But with a new Toyota RAV4 debuting in a couple weeks, and with Honda’s recent redesign of the CR-V, Ford will still need to push the Escape as much as they can. This is the hottest segment in the automotive industry, and Ford knows it. People are back to being obsessed with wanting SUVs for some reason. That’s why Ford is investing less into passenger cars, and even dropping some from our market altogether (the Fusion and Fiesta are not long for the Canadian car market). In a segment that is fierce with competition though, the Escape still manages to carve itself a good chunk out of it. After having tried it four times in five years, I can certainly understand why.